Did you set yourself a goal to get more active in the New Year? Finding it hard to stick to it? You are not alone. We often reach the point where we are fed up with our lack of energy and tired of being out of shape so we take the plunge to finally make a change. Maybe you purchased a gym membership or signed up for a program with a few friends but slowly everyone starts to dwindle off and eventually you taper off and quit as well. You may be looking at the “regulars” around you at the gym and asking yourself – how do they stick to it? What is their secret? The truth is, it is not so much discipline or willpower that keeps people coming back. The secret is to make exercise a habit – part of your every day life that becomes as regular as taking a shower or brushing your teeth! How does one go about doing that you ask? Here are some great tips on how to make exercise a habit. 1. Set your Goal. What do you want to achieve? Are you looking to tone up, increase your energy level, lose fat or train for an event? There are a number of reasons that you may be motivated to begin an exercise program. Before you take out a gym membership or join a program, start by setting a definite goal for yourself. Define what it is you want to achieve. Don’t try to take on too much at one time. Set yourself one goal and then once you achieve it, you can work towards another one. 2. Set a Deadline. Set a date by which you will reach your goal. 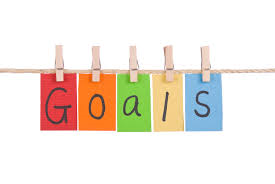 Write your goal and deadline on a piece of paper and put it somewhere you can see it multiple times a day. Share it with someone that you can rely on to help keep you on track. 3. Make a Plan. Once you have set your goal, you must back it up with a plan. What type of exercise do you need to do to reach your goal? How many times per week will you go to the gym? What other activities will make up part of your program. By creating a program for yourself and scheduling in your exercise time like any other appointment, you are much more likely to stick to it. Your time is precious so make sure you make the most of your time and have a solid program in place. Seek the guidance of a certified trainer if you need help to set up a program. They can offer you guidance and advise on how to accomplish your goals and also help you to remain accountable to your program. 4. Stick to your Plan. There are bound to be days when you just don’t feel like hitting the gym. But on those days, getting there is often the hardest part. Stick to the plan and don’t deviate from your plan. The more you stick to it, the easier it will become. Stay focused on the goal and carry on! 5. Train With Someone Who Has The Exercise Habit. If your training partner quits, you will likely end up quitting too. But if your training partner hangs on, you will take it as a challenge. Find someone who is serious with their goal and training. A good training partner will motivate you and help you achieve your goal. 6. Be confident. You can achieve whatever you want, if you believe that you can do it. Having a clear goal and a plan will already arm you with self-confidence. Know that it will take 30 days to build the exercise habit and during the first 30 days you will need to push yourself to the gym. After 30 days it will become easier and you will actually look forward to your workout and miss it if there are days you can’t make it happen. Remember, if you set your mind to it and stay focused on the goal, you will succeed! Keep a positive outlook and surround yourself with people who can help you on your road to success with support and encouragement. 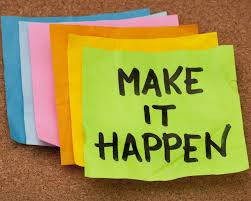 Get ready to MAKE IT HAPPEN!